Apple is one of the most leading smartphone makers in the world. One of the best things about iOS devices is that they come with native parental control features. While it is quite easy to set up the parental controls (restrictions) on the device, they can sometimes tamper with its function. Also, too many times, kids learn how to turn off parental controls on iPhone secretly. 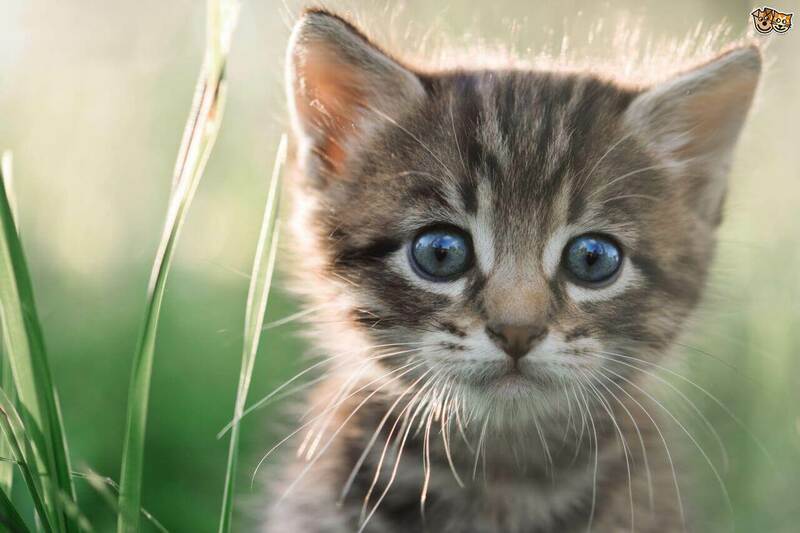 Therefore, it is important to implement a more stringent technique to control their behavior. In this guide, we will teach you how to turn off parental controls on iPhone (the native feature) and use a third-party tool instead. How can iPhone Parental Control Restrictions help us? 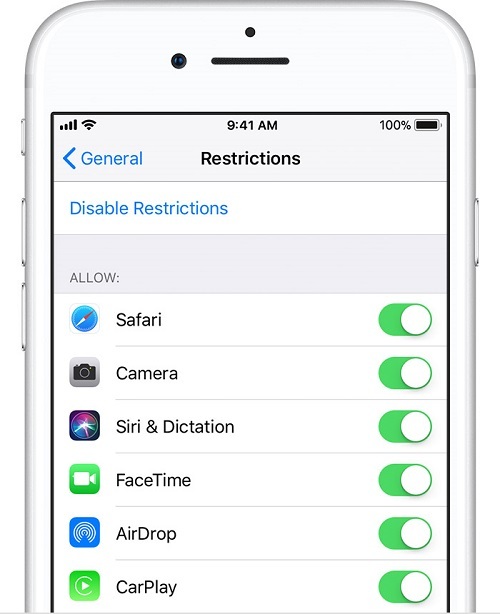 The “Restrictions” option is a native feature on iOS devices, which can be used for parental control. Ideally, it can help you in the following ways. 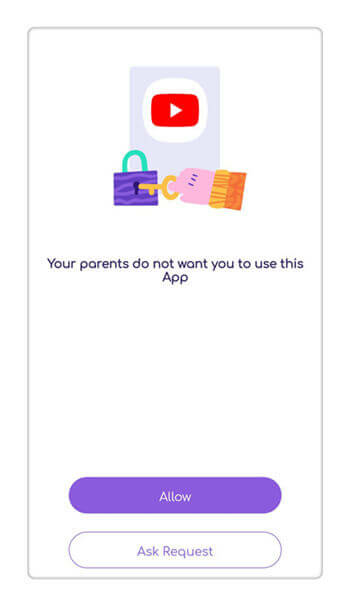 Parents can control the apps their kids can access on the device. You can put restrictions on crucial apps like Safari, Siri, App Store, and more. It can also restrict the installation of certain apps from the App store. The feature can also restrict the purchase of adult content like TV shows, music, and books. You can even add certain websites to the block list as well. Parents can even control their kids from playing multiplayer games and adding other users as friends on gaming apps. The advanced Parental Control feature that comes with iOS 12 can also be used to set time limitations on the device and apps. It comes with advanced content restriction features as well. 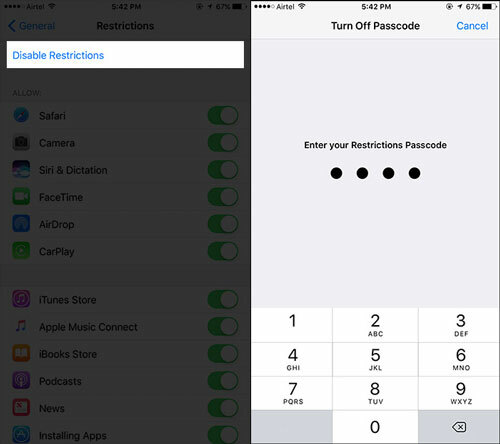 How to turn off iPhone Parental Control - Restrictions with the passcode? If you already know the restriction password, then you can easily turn off the parental control feature. All you need to do is go to your device settings and disable restrictions. In this way, you can turn off parental controls on iPhone without losing your data. All you need to do is follow these steps. 1. Go to your device’s Settings > General > Restrictions. 2. 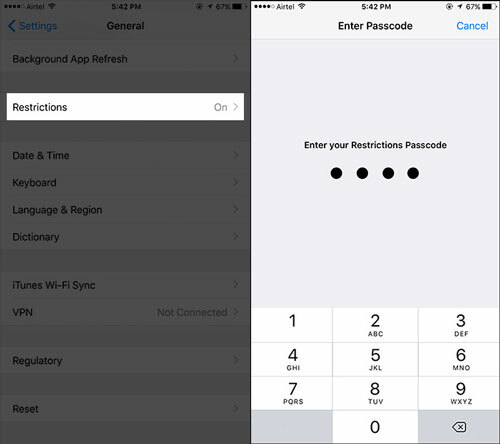 In order to access the Restrictions settings, you need to provide the restriction passcode. 3. After authenticating your restriction passcode, you can access all the relevant options. Simply tap on “Disable Restrictions” to turn it off. 4. Furthermore, you will be asked to authenticate your choice by providing the restrictions passcode once again. In the end, all the saved restrictions will be turned off without causing any data loss on your device. How to turn off iPhone Parental Control - Restrictions without the passcode? If you do not remember the Restrictions Passcode, then you might need to take some added measures to turn it off. 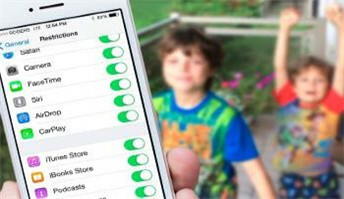 The most hassle-free and fast way to turn off parental controls on iPhone without the restrictions passcode is by factory resetting the device. As the name suggests, your device will be restored to its default settings. This will overwrite all the saved restrictions and make them void. Though, it will also delete the existing data and saved settings on your device as well. 1.Unlock your device and go to its Settings > General. 2. Scroll a little and tap on the “Reset” option. 3. Choose to “Erase All Content and Settings” from all the provided options. This will factory reset the device. 4. In order to confirm your choice, you need to provide your phone’s passcode. Remember, this should be your phone’s passcode and not the restrictions password. 5. In the end, just tap on the “Erase iPhone” button. Sit back and wait for a while as your phone would be restarted with default settings. As you can see, anyone can turn off parental controls on iPhone. Therefore, are a parent, you need to come up with a better plan. We recommend using FamiSafe as it is one of the best parental control apps that you can try. 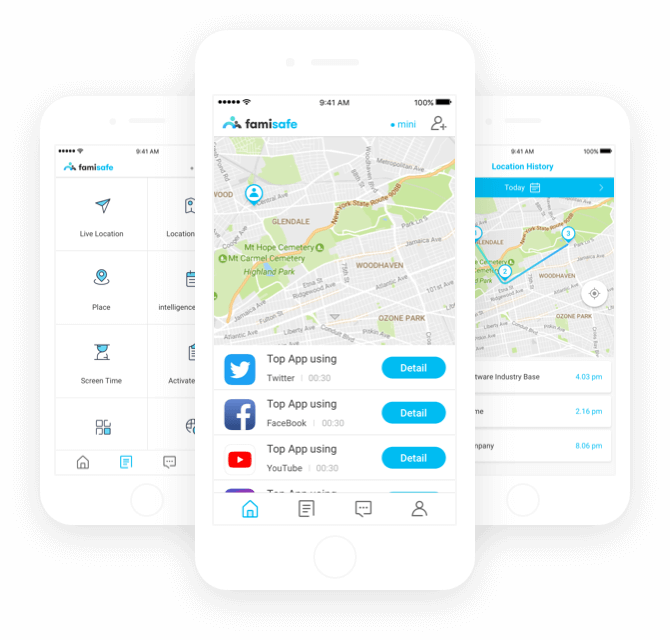 Compatible with every leading iOS and Android device, it will let you monitor and control your kid’s smartphone remotely. FamiSafe can be used to block any app on the device whenever and wherever you want. You can also disable the entire device access remotely. There is a provision to set screen time for the device and all the leading apps. Parents can also monitor how their kids use their smartphones. You can set restrictions on their browsing as well by blocking any website. The app also tracks the real-time location of a device. It is extremely easy to use and does not require jailbreaking of the device as well. How to Prevent Your Child from disabling iPhone Parental Controls? Unlike iPhone restrictions, your kids can’t simply disable the parental controls implemented by FamiSafe. Therefore, if you want to prevent your kids from turning off any parental control on iPhone, then simply use FamiSafe. Whenever they would surpass any app limit or would try to access any blocked content, they will get a relevant prompt on the device. To access it, they need to first request permission to parents. Simply make sure that your kids can’t uninstall the FamiSafe app on their device without knowing the password. To do this, you can just block their access to their device settings and prevent them from uninstalling FamiSafe from their device. As long as it is installed, you won’t face any trouble implementing the parental controls. Great! Now when you know how to turn off parental controls on iPhone, you can understand how easy it is to bypass iPhone restrictions. To make sure that your kids won’t be able to turn it off, use a reliable application like FamiSafe. It is packed with numerous advanced features and will make sure that your kids won’t misuse their smartphone or access any inappropriate content behind your back.